There’s been a lot of noise in the news lately about the news—false news, that is. When you think about it, human beings have always lived in a world where some of the news (okay, maybe we should call it gossip) is false while some of it is true. All of us base our own “truthiness” (I love Stephen Colbert’s word) on assumptions that we make about other people. Too often, instead of asking direct questions, we watch, we perceive (through our own particular prism), and then we concoct our own version of events. Let’s take a peak at one of those instances taking place in Carding, Vermont right now, shall we? 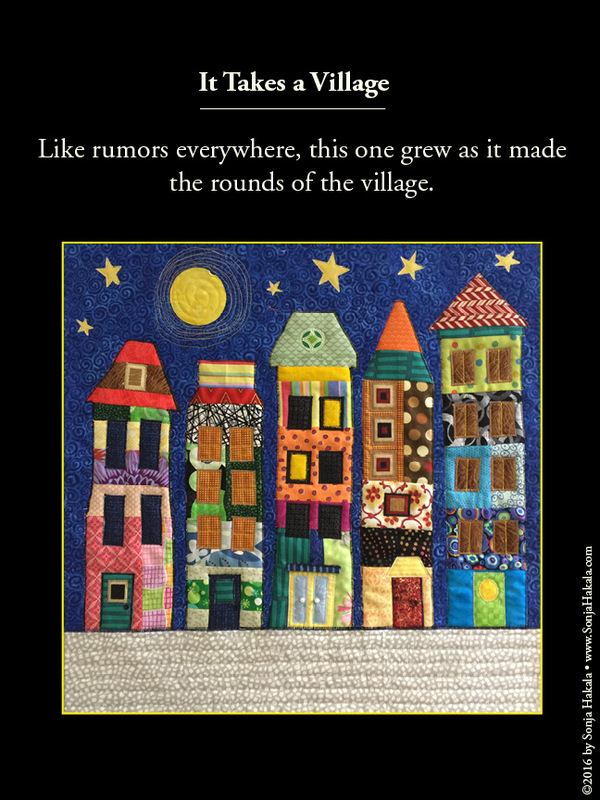 Oh, before we get on with it, two more notes: A great big thank you to Susan Baker for sharing her whimsical mini-quilt to illustrate this Carding Chronicle. And if you want to know the whole story behind the romance of Ted Owen and Paula Bouton, you’ll find part of it in my first Carding novel, The Road Unsalted (now on sale on Amazon for $8.79) and more in my latest novel, The Dazzling Uncertainty of Life. Both of them make great holiday gifts, by the way. Folks around Carding just love weddings, especially when they are scheduled to happen to two of the best known people in the village. The bride-to-be in this case is the town manager, Paula Bouton. And the groom is Carding’s postmaster, Ted Owen. Ted and Paula have known one another since high school when Paula’s parents bought a home near the base of the local ski mountain, Mount Merino. The Boutons didn’t take on one of the condos rising in a ring around the golf course. Nope. They bought a glorious, nearly-falling-down Victorian right where Main Street empties into Route 37. It was the kind of place that every local described as “you can’t miss it.” And you couldn’t, especially after Paula’s parents painted it green with electric yellow trim. Paula was the only girl in that family. She had three older brothers and one younger so she was no shrinking violet when she entered Carding High School. Which is probably why Ted, though attracted to her even back then, never got up the nerve to ask her out. They did ski together, however, on the school team. And then later, when Ted’s star started rising on the slalom circuit, Paula became one of the down-parka entourage that traveled to competitions around New England. That all stopped the night that Ted’s mother, Anna, died in a skiing accident on Merino. After that, Ted stowed his skis away, vowing never to touch them again. When they graduated, Paula went off to college in Massachusetts while Ted attended a local school, though his heart was never in it. He worked in the post office one summer when he was on break, and when the Carding postmaster job opened up, he took the job, and sagged into its routine with relief. Don’t get me wrong. Ted didn’t retreat from the world entirely. He had lots of friends, helped them build houses and watched their families grow. He became an assistant coach for the high school basketball team, and took care of his father after Robert was diagnosed with Parkinson’s disease. He collected and made toys for Christmas giving, and jammed with his best friend, Peter Foster, until he got good enough on the mandolin to be part of Pete’s band, Thieves of Fire. Peter often thought of Ted as frozen in time, at least emotionally. But no amount of talk or coaxing seemed to spark Ted’s outlook on life. After college and a job in California, Paula took the town manager’s job, in part because she’d never forgotten Ted. Peter thought he sensed a thaw in his friend for a while but it didn’t amount to much. But things changed after Ted’s good-for-not-much sister, Allison, unceremoniously dumped her twelve-year old daughter, Suzanna, on Ted’s doorstop. “I guess it takes two wounded people to make a whole,” Edie Wolfe observed as the town watched Ted wake up and Suzanna blossom. Ted made sure his niece had friends. They papered and repainted her bedroom together. He got her settled in school, and eventually got full custody of the girl. But most remarkably, he taught Suzanna how to ski on a small hill behind his house. Then one day, almost by accident, Ted found himself on the top of a snow-covered Mount Merino with a group of his friends, including Paula, who’d been waiting for that moment for a long time. Now Ted and Paula are engaged. That’s where the false news part of our story begins. It all started with muffins. Morning glory muffins, to be exact, the ones filled with ginger and raisins and nuts and shreds of carrot made by Diana Bennett at the Crow Town Bakery. Paula loved them and Ted knew it. So every morning before work, he’d stop at the bakery for coffee and a muffin. Paula treasured each of them, savoring each bite while going through her morning routine at work. Knowing her predilection for the spicy treats, pre-Ted Paula had carefully limited her muffin intake to one a week. But beloved bliss made her forgetful, and before she knew it, the dreaded poundage number on her scale was creeping up. Not a lot, mind you, but for a woman who is incredibly fit, the extra pastry made its presence known rather quickly. The first one to notice, besides Paula herself, was the assistant dress fitter at the shop where our bride-to-be had found the perfect gown—and elegant ecru, long-sleeved, body-hugging shift with just a bit of lace at the neck and around the bottom of the skirt. The assistant, one Greta Trapeni, had warned Paula about keeping her weight exactly the same as the day she purchased the dress. At the final fitting, Greta hhhmmmed as she struggled with the dress’s zipper. Then she tut-tutted as she moved the fabric around. Greta nodded but Paula’s gesture—the hand on the abdomen—had not escaped her notice. “So how did Paula’s fitting go?” her boss, Vera, asked later. “Well, the dress would fall just right except that Paula’s gained a tiny bit of weight in just the wrong spot,” Greta said as she stirred half-n-half into her coffee. Greta placed her hand on her abdomen, and the two women gave one another a knowing look. “She said something about morning glory muffins and that she’d take care of it before the wedding so that’s all it may be,” Greta told her boss. Well, that’s all it took. As I said, the coming nuptials of Ted and Paula were something of a public event in Carding because everyone knew them and discussed every wedding detail over groceries in the Coop General Store and breakfast at the Crow Town Bakery. By the end of the second day, Ted noticed that a couple of his older customers were waggling their eyebrows at him with knowing grins. But he passed it off as wedding anticipation. Then Paula noticed that folks coming in to town hall to pay their taxes or buy dump tickets or hunting licenses were looking intently at her abdomen. The staring, of course, just made her more self-conscious about those muffins, and she confessed to Ted over lunch that her indulgence had had consequences. Like rumors everywhere, this one grew as it made the rounds of the village. When Paula reached for a cracker to accompany her soup at the bakery, moms noticed, and remembered how they had used Saltines to quell their own queasiness in their first trimesters. This led to rampant speculation about how far along Paula was, when the baby would be born, and whether the date of the wedding should be moved up from New Year’s Day to something closer to Halloween. People started suggesting baby names to one another, and the enterprising president of the PTA suggested making a betting pool on the birth date and time as a fundraiser for new soccer nets at the elementary school. That’s how Edie Wolfe finally heard the news. “Paula Bouton pregnant?” she said incredulously when her daughter passed along the gossip. “No, neither she nor Ted have been in since I’ve heard the news which is kind of unusual, now that you ask.” Diana frowned and wrinkled up her forehead. “Ted’s been in every day for weeks buying Paula coffee and…” She started to grin. Now Edie Wolfe is one of those practical, down-to-earth women. You’d like her if you met her. She’s straightforward without being abrupt, honest without being self-righteous, and she’s pretty good at seeing the humor in most of life’s tangles. This was a delicate subject, for sure, because there was still an outside chance that Paula was pregnant so Edie tossed around and then rejected several different approaches as she walked to the town hall. When she found Paula eating a small salad and drinking water at her desk, Edie was sure a direct approach was her best choice. It was much quicker, usually, to just get right to it. “I’m not sure where it started but many seem to assume that you’ve acquired a baby bump,” Edie said. And then the two women looked at one another and started to laugh. It took a while to quell the rumor mill because once those winds whip up, they are difficult to calm because false gossip is more colorful and dramatic than the plain truth. But I’m glad to report that Paula’s gown now fits beautifully. After they’re married, she and Ted may decide to have a child of their own. But that is up to them. Not us.